NAFSA's 2015 Ron Moffatt Seminar on Peace and the Global Civil Society was held May 29–30, 2015, in Boston, Massachusetts. 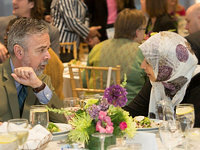 The event, which brings together scholars and practitioners in peacebuilding and conflict resolution with international educators, is designed to promote enlightened international relations, a globally engaged citizenry, and a more peaceful world. Ambassador Antonio de Aguiar Patriota, permanent representative of Brazil to the United Nations, chair of the United Nations Commission on the Status of Woman, and former chairman of the United Nations Peacebuilding Commission, spoke on the topic of peacebuilding and the challenges to a peaceful world. Jeffrey Helsing, PhD, United States Institute of Peace, provided an overview of the ways in which education can be used as a tool to promote peacebuilding, particularly in countering violent extremism. Donald Daniel, PhD, Georgetown University, former special assistant to the chairman of the National Intelligence Council, provided an overview of the contexts within which “peace operations” are undertaken. Ismael Muvingi, PhD, Nova Southeastern University, presented on the ways in which global and local issues affect conflict resolution and peacebuilding attempts on the ground. Dimitry Anselme, MEd, Facing History and Ourselves, provided an overview of Facing History’s Scope and Sequence approach to teaching students about their role in addressing conflict. Melanie Greenberg, JD, president and CEO, Alliance for Peacebuilding, provided a concluding address about the ways in which individuals can be empowered to build peace. Accompanying the speaker presentations were a number of facilitated large-group and small-group discussions. The NAFSA Ron Moffatt Seminar was named after past NAFSA president Ron Moffatt, a tireless campaigner for peace and justice education through international education, and an advocate for international education as a peacebuilding enterprise. The NAFSA 2016 Ron Moffatt Seminar will be held June 3–4, 2016, in Denver, Colorado. Antonio de Aguiar Patriota was born in Rio de Janeiro on 27 April 1954 and is currently the Permanent Representative of Brazil to the United Nations. He was Minister of External Relations of Brazil from January 2011 to August 2013; Deputy Foreign Minister from October 2009 to December 2010; Ambassador of Brazil to the United States from 2007 to 2009; Undersecretary-General for Political Affairs at the Foreign Ministry from 2005 to 2007; Chief of Staff to the Foreign Minister, in 2004; and Secretary for Diplomatic Planning at the Foreign Ministry, in 2003. From 1992 to 1994, he was Deputy Diplomatic Advisor to then President Itamar Franco. Overseas, he has served in Washington (2007-2009), twice in Geneva (1983-1987 and 1999-2003) and New York (1994-1999 and 2013-today), in Caracas (1988-1990) and in Beijing (1987-1988). He graduated from Brazil's Diplomatic Academy in 1979, after studying philosophy at the University of Geneva. He currently serves as Chair of the UN Commission on the Status of Women and is the former Chairman of the UN Peacebuilding Commission. Melanie Cohen Greenberg is President and CEO of the Alliance for Peacebuilding. Before joining the AfP, she was the President and Founder of the Cypress Fund for Peace and Security, a foundation making grants in the areas of peacebuilding and nuclear nonproliferation. From 2003 to 2004, she was a visiting scholar at the Johns Hopkins School for Advanced International Studies, focusing on issues of justice in post-conflict peacebuilding. From 2000 to 2002, Greenberg was director of the Conflict Resolution Program at the William and Flora Hewlett Foundation. She previously served as associate director of the Stanford Center for International Security and Cooperation and deputy director of the Stanford Center on International Conflict and Negotiation. In her work on international conflict resolution, she has helped design and facilitate public peace processes in the Middle East, Northern Ireland, and the Caucasus. Greenberg is a frequent writer, lecturer, teacher, and trainer in a broad range of areas related to international law, international security, and peacebuilding. In her training, she has led courses for Congressional staff, scientists at the National Institutes of Health, international lawyers, business executives, and graduate students from around the world. Prior to the joining the Global Centre for the Responsibility to Protect, Simon Adams, PhD, served as Pro Vice Chancellor (International Engagement) at Monash University, Australia's largest public university, and as Vice President of its South African campus between 2008-2010. Adams has worked extensively with governments and civil society organizations in South Africa, East Timor, Rwanda, Mozambique, Ireland, and elsewhere. He is the author of four books and numerous academic articles with a focus on international conflict. He has also written for the New York Times, Chicago Tribune, The Australian, Huffington Post, International Herald Tribune, News24 (South Africa), O Estado de S. Paulo (Brazil), Los Angeles Times, and many other publications. Adams has appeared as an expert commentator on Al-Jazeera, BBC, ARD (Germany), Chinese Central Television, and numerous other media. Dimitry Anselme, MEd, is the director of program staff development at Facing History & Ourselves. He joined the staff in 1999 after teaching American & World History courses at Doherty High School in Worcester and at Brookline High school for 8 years. In 2004, he became the high school principal for the Academy of the Pacific Rim Charter Public School. He rejoined Facing History & Ourselves in his current position in 2007. Anselme graduated from Clark University and received his Master of Education at the Harvard Graduate School of Education. He is originally from Haiti and grew up in Zaire (now Democratic Republic of Congo) and has been living in the Boston area since 1985. Anselme worked as an advisor for Gay/Straight Student Alliance in schools. He worked as a consultant for the Massachusetts Department of Public Health and Department of Education to support the needs of high school LGBT students. He has served on the Brookline high school task force for Black Males Student Achievement. He served on the board of the Haitian-Multi Service Center of Catholic Charities in Boston. He is currently a university trustee for Clark University in Worcester, Massachusetts. Fanta Aw, PhD, is assistant vice president of campus life at American University. Aw advises university senior leadership on campus internationalization, and on matters of diversity and inclusion. She received her MA in public administration with a focus on organizational development and her PhD in sociology from American University. Her areas of specialization include transnational migration, international education, and intercultural communication. Aw joined the NAFSA Board of Directors in 2009 and became president and chair in 2013. Donald C. F. Daniel, PhD, retired in 2013 after serving 11 years as a professor in the Security Studies Program in the School of Foreign Service of Georgetown University, where he retains adjunct status. He is also Milton E. Miles professor emeritus of International Relations at the Naval War College in Newport, RI. Other positions include special assistant to the Chairman of the US Intelligence Council in Washington (where he had the peacekeeping account); Director of the Strategic Research Department at the Naval War College; Ford Foundation-funded Research Fellow at the Brookings Institution in Washington; Research Associate at the International Institute for Strategic Studies in London; a researcher-in-residence for the United Nations Institute for Disarmament Research in Geneva; and Associate Fellow of the Department of Military History, Swedish National Defense College, Stockholm. In addition to teaching, research, and administration, he directed numerous political-military simulations involving participants from all regions of the world with simulations taking place in the United States, Europe and the Pacific. He was instrumental in bringing together high level foreign policy and naval officials from the United States and Russia to a series of meetings that contributed to implemented naval confidence-building measures. He has also served as a consultant to the United Nations and various US Government agencies on issues of peacekeeping. He has authored or edited 11 books and published over 60 articles. His book on Coercive Inducement and the Containment of Crises was the runner-up for the 2000 Grawemeyer Award on Ideas for Improving World Order. He holds a PhD from Georgetown University and was a Vietnam era naval officer. Jeffrey Helsing, PhD, oversees the content of USIP’s education and training programs as well as curriculum development in the United States and in conflict zones abroad. Helsing has close to two decades of conflict resolution training globally, particularly in the Middle East. For more than eight years, Helsing worked with groups in Israel and the Palestinian Authority training educators, NGO workers, university students and young leaders in developing conflict resolution, nonviolence, human rights, and communication and facilitation skills. He has 20 years of experience as an educator, including teaching at the American University in Cairo, George Washington University, Swarthmore College and the University of Pennsylvania. Helsing has taught a broad range of international relations subjects, including conflict resolution, human rights, comparative foreign policies, American foreign policy and international relations theory. He has written articles on conflicts in the Middle East and co-edited a book on the links between human rights, humanitarian law and peacebuilding as well as written articles and delivered numerous conference papers on the impact of education policies and projects in conflict zones. Helsing holds a bachelor’s degree in history from Stanford University and a doctorate in political science from Columbia University. LaBrie, PhD, is the dean of the College of Professional Studies and vice president for professional education. He has led growth in enrollment and initiated curricular reviews at the College, and today he leads one of the country's largest colleges of professional studies, offering qualified returning students and working adults the opportunity to pursue bachelor's, master's, and doctoral degrees. His responsibilities include oversight of Northeastern University (NU) Global, a unique group of international and U.S.-based programs for international students to study at the University's undergraduate and graduate levels. Additionally, LaBrie provides direction for Northeastern University’s expanding portfolio of online and graduate professional degree programs and the university’s regional graduate campuses in Charlotte, North Carolina and Seattle, Washington. Ismael Muvingi, LLB, PhD, is Associate Professor in Conflict Resolution at Nova Southeastern University, Florida. He is a native of Zimbabwe and, during Zimbabwe's civil war, worked for the Catholic Commission for Justice and Peace to record the stories of unarmed civilians caught in war zones. After Zimbabwe’s independence, Muvingi practiced law for 18 years in the private and the public sectors and also served as a part-time lecturer of law at the University of Zimbabwe. Before joining Nova Southeastern University, he led a Catholic Relief Services legislative advocacy campaign on conflict resolution and HIV/AIDS in Africa and taught conflict resolution at Menno Simons College, University of Winnipeg, Canada. His research interests include transitional justice, human rights and peacebuilding with a regional focus on Sub-Saharan Africa. Patrick F. Plunkett, PhD, is the senior associate dean for global engagement and the executive director of Northeastern University Global. Plunkett is responsible for advocating and providing academic leadership for several strategic international programs including the American Classroom program, U.S. Pathway Program (USPP), and Global Student Success (GSS). He is also senior advisor to the dean on international issues, and provides administrative oversight of the University's international affiliations and contracts. Eric Popkin, PhD, is Associate Professor of Sociology and Director of Global Social Innovation Programs at Colorado College. He recently completed eight years as Associate Dean of Global, Community and Summer Programs, Dean of Summer Programs, and Founding Director of the Colorado College Partnership for Civic Engagement. In his current administrative position, Popkin co-developed a nine week, summer global sustainability internship program in collaboration with the Foundation for Sustainable Development and Social Entrepreneur Corps (Ecuador, Bolivia, India) tied to a course that critically examines community-based international development efforts within a broader analysis of development paradigms and explores the role of outsiders engaged in this work. He served as campus change leader for the college’s successful effort to obtain the Ashoka Changemaker campus designation (third liberal arts college in the country to obtain this designation). Over the course of his 17 year academic career, Popkin has designed international community based learning programs tied to academic courses in Cuba, Mexico, Bolivia, Peru, Ecuador and along the U.S-Mexican border and worked extensively with immigrant communities in New York and Colorado. This work included his establishment of the first U.S. liberal arts college semester program at the University of Havana, Cuba. Prior to entering academia, he engaged in human rights work in Central America during the civil wars of the 1980s including the coordination of high level delegations to conflicted regions of El Salvador. 8:30 p.m. Shuttle departs Northeastern University for the Sheraton Boston Hotel following the keynote address. 7:45 a.m. Shuttle departs the Sheraton Boston Hotel for Northeastern University. NAFSA thanks its partner organizations, the United States Institute of Peace (USIP) and the Woodrow Wilson International Center for Scholars, for their assistance with this event.